The Calgary housing market was almost like a tale of two cities during the month of August, with the detached housing market having a much different outcome than the higher-density segments. Nonetheless, sales activity was down overall within the Calgary housing market, with total sales reaching just 1,567 for the month. 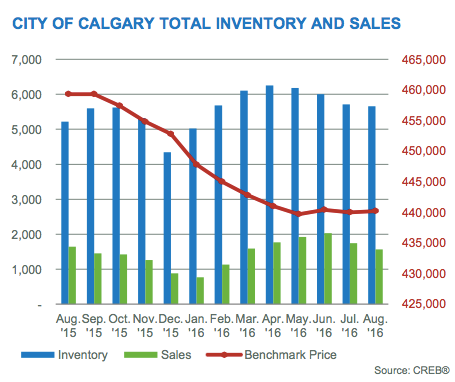 The most recent CREB report has found that sales activity continues to decline in the City of Calgary. Just as the city has continued to struggle in all economic aspects, so has its housing market. This condition has only been further exacerbated by the declining net migration levels within the city. According to the CREB report, housing sales activity in Calgary reached a total of 1,741 units during the month of July. This represents a 12.6 percent decrease when compared to the same time last year, making it the 20th consecutive month in which the city has experienced a drop in year-over-year sales. As the number of unemployed workers within the city continues to grow, the net migration continues to fall and job loss continues to be a problem, the overall state of the housing market has also continued to weaken.